and problems like Hoof abscesses occurring. So provided below (by AGNES BANKS EQUINE CLINIC) is some basic information on what this problem is and how its is treated. 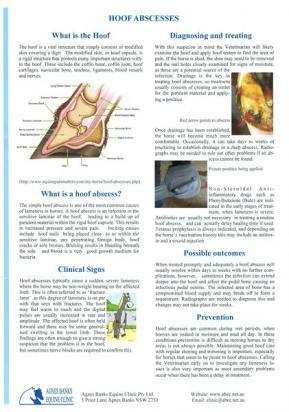 The simple hoof abscess is one of the most common causes in lameness in horses. It's an Infection in the hoof which is lead to a build up of material within the hoof capsule, resulting in pressure and server pain. Other causes include hoof nails being placed wrong, hoof cracks or sole bruises that grow bacteria. Drainage is the key in treatment. Once drainage has been established the horse will become more comfortable, and when treated promptly will resolve within days to weeks with no further complications.